How Do You Use Dimensional Analysis to Convert Units on One Part of a Rate? Word problems are a great way to see math in action! 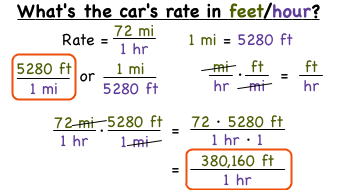 In this tutorial, learn how to use the information given in a word problem to create a rate. Then, find and use a conversion factor to convert a unit in the rate. Take a look! What are Rates and Unit Rates? Can you do 100 sit-ups in 2 minutes? That's a rate! Driving a car going 40 miles per hour? That's a unit rate! Watch this tutorial to learn about rate and unit rate (and the difference!). How Do You Do Long Multiplication? Multiplying together large numbers? No problem! In this tutorial, you'll see how to perform long multiplication to find the answer (without using a calculator!). Take a look!